As a moderator on a Christian writing site, I have experienced the site’s occasional hiccups, which happens at one time or another on all sites on the internet. FORBIDDENYou don’t have permission to access /group.php on this server. The words practically slapped me in the forehead! I thought, wouldn’t it be nice if, before we decide to succumb to some God-forbidden temptation in life, a huge FORBIDDEN warning sign popped up in front of us? 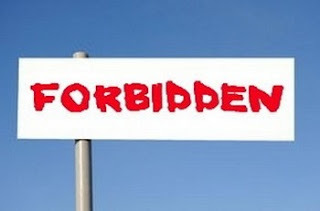 When the seductions of the world beckon with a come-hither finger to woo us from our faith and principles, wouldn’t it be reassuring if a warning sign materialized in front of us that said: FORBIDDEN…you don’t have permission to access that! But we do have that warning sign…the Holy Spirit! Jesus said He would leave His peace to the world. That peace comes to us through His Spirit, which rules in our hearts as an umpire. Rely on the Spirit’s guidance and you will always have peace about all you decide to do. I love reading your thoughts, Lynn. May God bless you as you follow His call! Great post Lynn, words popping off the page, as t sometimes happens. The Holy Spirit is a much better choice to help us resist temptation and sin. Being forbidden to do something often makes it even more alluring and tempting. Good thoughts, Lynn, and great encouragement, as always! People tease me about being so honest. It isn’t because I am more virtuous than others. I get caught too easily and have long ago given up any ideas of doing what I shouldn’t. 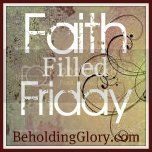 As my faith grew, the fear of being caught was replaced with the desire not to hurt, God or others. Seeing the word Forbidden would send me scurrying from the room in panic. Glad it only my conscious that I see. Less unsettling that way. Good post, I could see that as a huge deterrent to many tempted to go and do what they should not. Loved this post, Lynn. Sometimes we need to clean out our ears to hear the Holy Spirit better. Great points, Lynn. Thanks for the fun AND important food for thought :). Hi Lynn, great post and great reminder that the Holy Spirit speaks to us and guides us to protect us from the wiles of the evil one!!! Fantastic analogy. I, too wish for the “Big red letters,” but you’re right. That’s the Holy Spirit’s function if we will but only listen! AMEN! We too often forget the Holy Spirit.